Two theaters within two blocks of each other on Mission Street share some striking similarities. Both were built after the 1906 earthquake spurred a construction rush along Mission. Both were modernized with New Deal-era loans during the 1930s, adding ornate neon signs, deluxe interiors, and huge facades. 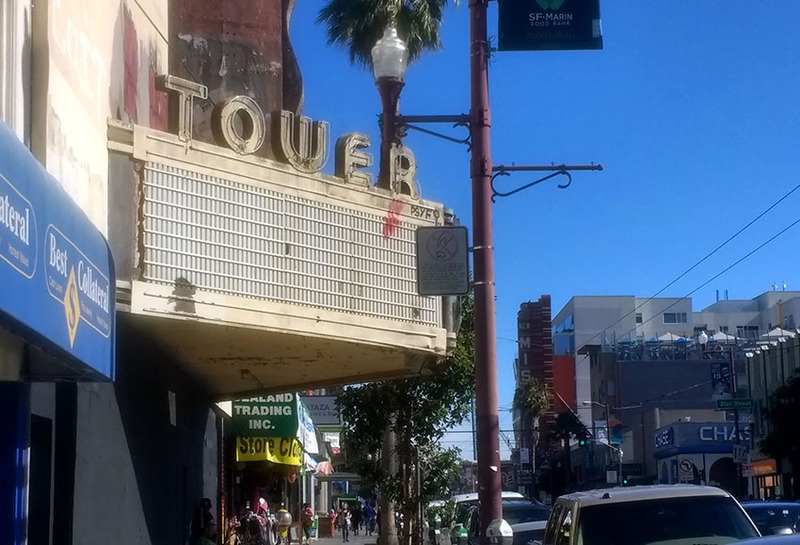 Now, more than a century after they first opened, the Tower theater at 2465 Mission, and the old Cine Latino theater at 2555 Mission — both owned by Vera Cort — face very different futures. The Tower is being renovated and will reopen as a site for the City College of San Francisco’s film school and movie theater. Rodrigo Santos, Principal of Santos & Urrutia, Structural Engineers. Santos is the developer behind renovations for CCSF’s film school at the Tower. The mural, under plastic, is being renovated. Photo by Elizabeth Creely. 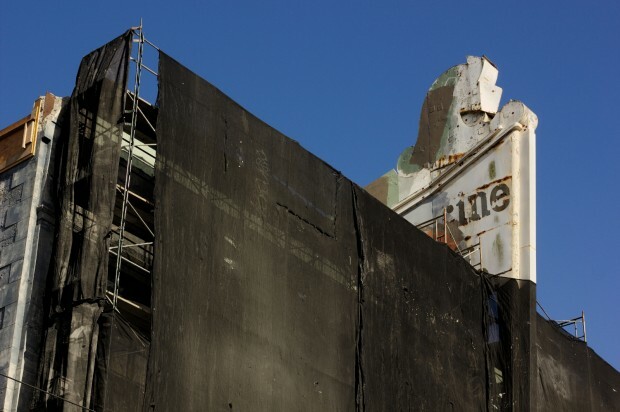 In contrast, Cine Latino has been reduced to its beams — a demolition of the front facade that the San Francisco Planning Department says was illegal — destroying the iconic neon sphinx that rested atop the ornate marquee. The department has ordered Cort to stop all work on the building and the demolition that left the facade looking like an undistinguished hulk is now being investigated by the City Attorney’s office. Cine Latino theater, July 2018. Photo by Elizabeth Creely. Cort and her architect argue that the demolition occurred before the city designated the building as historic, while the city says the scope of work on site went beyond what was allowed by Cort’s permit. Meanwhile, down the street at the Tower, between 20th and 21st Streets, the marquee barely hangs on. The metallic skin that covers the vertical sign is partly gone, and only the faint outline of two letters — E and R — remain. That, says Rodrigo Santos, a structural engineer and former trustee on the board of City College, will soon change as he moves ahead with plans to fully renovate the theater. It will be the fourth iteration of the theater since it first opened in April 1912 with 1,000 seats. Back then, it was known as The Majestic, and its developer was Mary Heffernan, an “extensive real estate owner,” the San Francisco Chronicle wrote in 1913. The Majestic, the first incarnation of what is now The Tower Theater, as it appeared in the San Francisco Call in 1912. From the Collection of Jack Tillmany. The façade first changed during the New Deal modernization of Mission Street, and again in 1942 when the mural, which depicts the founding of California and the industries of San Francisco, was added to the interior. That year, the Majestic also changed its name to The Tower. 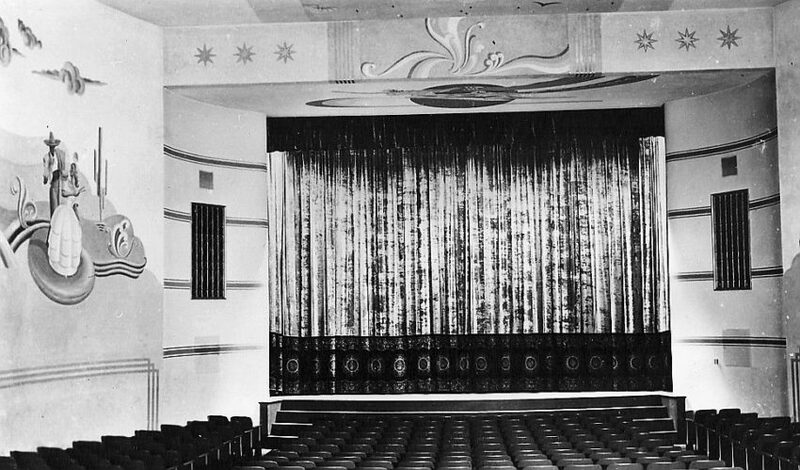 Interior of the Tower theater in 1943 after it had been newly restored. The mural on the left is now being restored. Photo by Ted Newman, from the Jack Tillmany collection. The blueprint for the project includes a plan to restore the neon lettering and the mural. 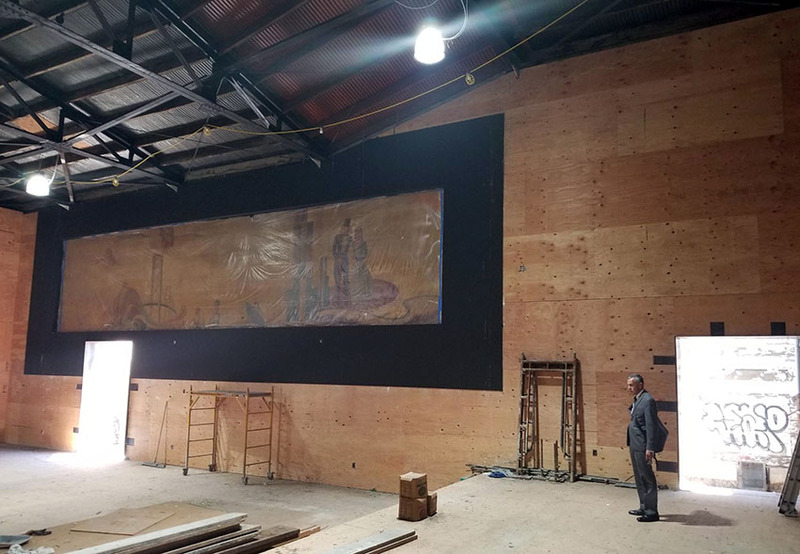 Santos says the mural is the most “crucial element” of the redesign, because its restoration must be complete before the construction of the interior and exterior proceeds. He’s in the process of hiring an artist, who must be approved by the Planning Department’s Historic Preservation team. Still, he sees the benefit in maintaining the historic elements of the building. No date has been set for the opening of the film school. Still, Santos — who says he’s the sole investor in the space — is clear on the reason he’s invested so much in the project: his love of film. Santos, who has been renovating the building with Cort’s agreement, is in talks with her to purchase it. He declined to state a figure, but expects the deal to go through sometime this year. The future is less rosy for the former Cine Latino theater. It stands stripped to its steel frame, its lengthy vertical marquee illegally demolished by Cort sometime after 2011, according to city planning records. In 2012, Cort said it would become a gym and a branch of Poets and Busboys, a salon-like restaurant space. Cine Latino in July 2012. 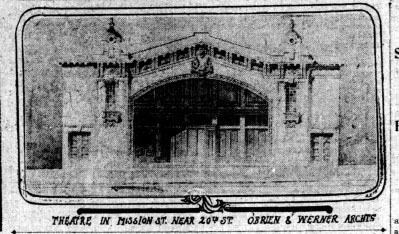 Those plans are on hold as the Mission’s second-oldest theater (the oldest is the Victoria Theater) clears up a conflict with the Planning Department on the demolition of the facade. Its history reaches back to 1906, when Joseph Bauer, the owner, purchased the lot with a $5 gold piece from George Crim, the “richest miser in California,” according to Bauer’s unpublished memoirs — and a man who had vast real estate holdings in the Mission District. Bauer writes in his memoirs that the first theater was a tent before becoming the Wigwam Theater, a “class A steel frame building,” in 1911. Inside, viewers watched movies, vaudeville and sometimes burlesque theater. Bauer notes proudly in his memoirs that his theatre was the only “girl show” in San Francisco from 1922 to 1925. 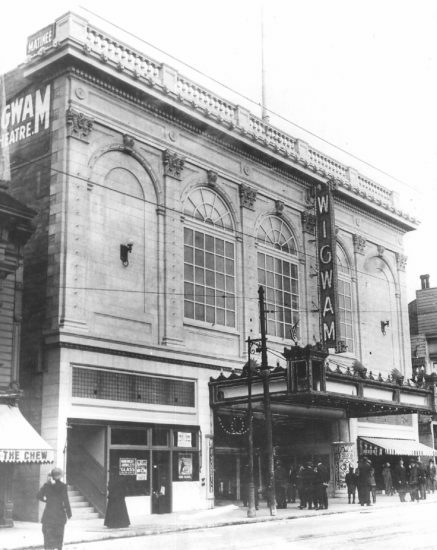 The Wigwam was the initial theater that eventually became Cine Latino. From the collection of Jack Tillmany. July 1913. Bauer sold the Wigwam to the Nassar Brothers in the mid-1920s. They changed the name to the New Rialto and hired the architect Fernand Frederic Amandes, famed for his work designing glamorous movie houses throughout the state, to modernize the building in the Streamline Moderne style that characterized Mission Street during the Depression. Curvilinear lines, ornate Art Deco features and neon signage distinguished that style. In the mid-1920s, the Wigwam started the first of several name changes. The first new name after the Wigwam was the Rialto. This photo was taken in 1938. From the collection of Jack Tillmany. The name of the theater changed twice more. In 1947, it became the Crown and, in 1978, the Cine Latino. The theater ceased operations in 1988. Photo by Tom Gray from the collection of Jack Tillmany. The Wigwam became the Rialto in the mid-1920s, the Crown in 1947, and then the Cine Latino in 1978. This photo was taken in June 1972. Photo by Tom Gray, from the collection of Jack Tillmany. 1975. Charles Hemminger, Cort’s architect, who specializes in adaptive re-use renovations, said the old theater, which has been empty for 30 years, was beyond help. The concrete had completely deteriorated, he said, a fact that was only discovered after construction work began. Hemminger also said that the aging building wasn’t considered historic in 2003 when the permit for work was granted. Furthermore, Simi said that the demolition took place after 2010 when the property was evaluated and listed as a historic resource eligible for inclusion on the California Register of Historical Resources. Hemminger, in an email, stated that he couldn’t recall exactly when the demolition commenced, but did say that he believed that the “majority” of it took place between 2011 and 2012, at least one year after the building was listed as a historic. The loss of the marquee has not gone unnoticed by the neighborhood but, like the project planners, no one is really sure when it happened. 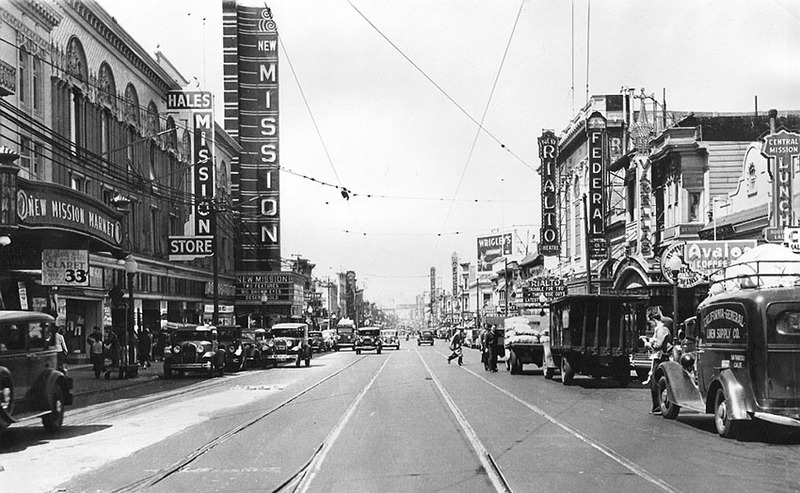 The New Mission Theater and the Rialto Theater (now Cine Latino and a skeleton) in July 1936 when Mission Street was known as the Miracle Mile. From the Collection of Jack Tillmany. Great article–I had forgotten that these skeletal ruins used to be a theater. 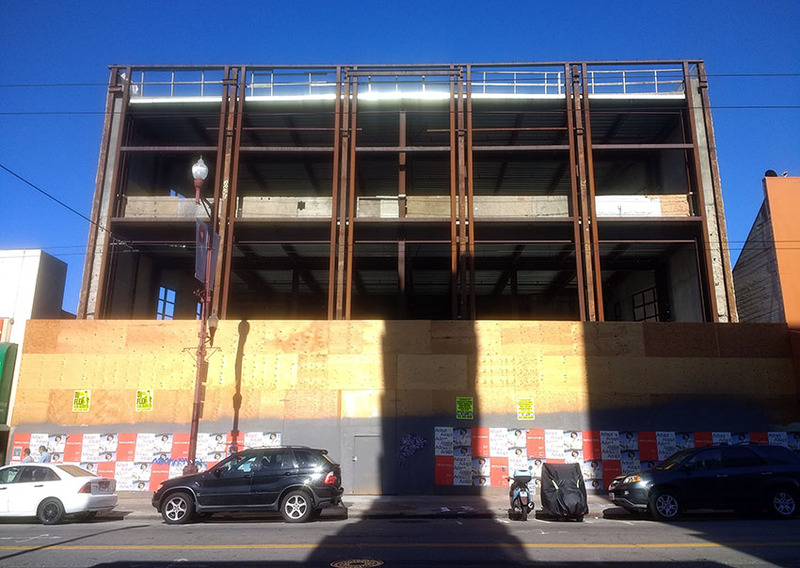 It is shocking that the city allows the Cine Latino Theater & the former appliance store at 18th & Mission to be mangled and then left to blight the streetscape. The owners/contractors should be fined. Thank goodness for the refurbished New Mission and Gray Area theaters! Thanks for the informative article. I’ve long wondered about these old theater buildings. I don’t understand why the skeletal remains of the old wigwam theater need to remain an eyesore while the investigation plods along. Why can’t restoration be performed (or even required) in parallel with the investigation? It would seem the City and neighborhood have a public interest in eliminating urban blight. It’s the NASSER brothers, not Nassat!